perhaps together for the first time ever! Thanks to the Grand National Executive Committee, Valley Forge and Potomac Region volunteers, National CLC volunteers, Corporate Sponsors, Individual Sponsors, Advertisers, Donors, the Hilton and the Westin for making the 2017 Grand National a memorable event! Read all about it and see photos. 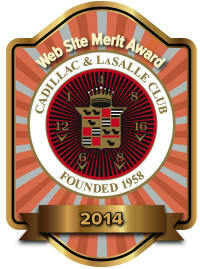 Welcome to the Cadillac & LaSalle Club (CLC) Potomac Region website. We are a Region of the International CLC. The CLC was founded in 1958 and has approximately 7,000 members worldwide. 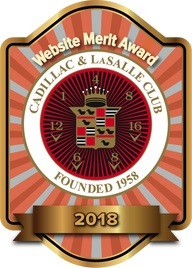 It was initially founded to encourage enthusiasts to maintain, preserve, and restore collectible Cadillacs and LaSalles built from 1902-1942. Now the CLC recognizes all vehicles built by Cadillac. We promote the development, collection, publication and exchange of helpful information pertaining to our cars. We also promote social fellowship for club members. Membership in the CLC entitles you to receive its award-winning monthly magazine, The Self-Starter, as well as its Annual International Membership Directory. For more information, visit the CLC website. The CLC Potomac Region was established in 1969 and has approximately 200 members in Maryland, Northern Virginia and the District of Columbia, as well as members in New Jersey, Pennsylvania and a few other states. To commemorate the Region's 35th Anniversary, an article featuring the Region appeared in May 2004 issue of The Self-Starter -- see story. The only pre-requisite for joining the Potomac Region is that the member also has to be a member of the National CLC. Membership in the Region entitles everyone to receive its award-winning monthly newsletter, the Caddie Chronicle. Read the special February 2012 issue of the Caddie Chronicle commemorating its 100th issue. Read the special December 2007 issue of the Caddie Chronicle commemorating its 50th issue. The Region holds monthly meetings in different locations throughout the year and co-sponsors one car show and one cars and coffee event per year at Capitol Cadillac in Greenbelt, Maryland, among other events. Following in the past tradition of celebrating a theme at the Annual Fall Car Show at Capitol Cadillac, the 2016 theme was Celebrating the 75th Anniversary of the 1941 Cadillac. The show was featured in Old Cars Weekly magazine. View full coverage including photos from the show. The 2015 theme was Magnificent Modifieds. The show celebrated the creativity and craftsmanship of these unique Cadillacs and LaSalles. 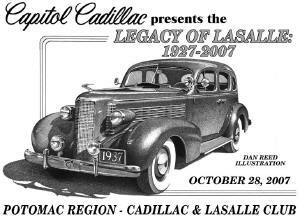 It was the first time a CLC regional dealer-sponsored car show featured modified Cadillacs and LaSalles. View pictures from the show. In 2014, the theme was Celebrating Capitol Cadillac’s 80th Anniversary. View a wonderful video of the show that was created by Matt Laur from Horizon Imageworks. It does a great job capturing the look and feel of these wonderful events at Capitol Cadillac. The 2013 theme was Colossal Convertibles, honoring the late Henry Ruby, long-time Car Show Coordinator, and the 60th anniversary of the 1953 Eldorado. As a tribute to Henry, his 1958 Eldorado Biarritz was on display, as well as the factory-built “super-charged” 1953 Eldorado (pictured right), one of the only two 1953 Cadillac LeMans concept cars remaining (pictured at top of home page) and a 1951 Cadillac custom convertible from the Scott Milestone collection. The show was held on Sunday October 27th. Read about the show. Our 2012 theme was Professional Pride, celebrating the long and storied history of Cadillac and LaSalle professional cars. Specifically, Cadillac and LaSalle ambulances, combinations, flower cars, hearses and limousines from the model years 1902 thru present were the honored cars at the show on Sunday October 28th in Greenbelt, MD. Read all about the event. The theme for 2011 was Dazzling DeVilles. Specifically, DeVilles from the model years 1949-1970 were honored at the show held on Sunday October 30th in Greenbelt, MD. These were among Cadillac's most popular models during the period when Cadillac became the undisputed sales leader in the luxury car market. Read about the show in the Caddie Chronicle. The 2010 theme was Fabulous Fleetwoods. There were 115 Cadillacs present including 44 Fleetwoods. It was the largest turnout ever for a car show at Capitol Cadillac. Cars were driven to the show from ten states, representing eight different CLC regions (ten regions counting members who attended without their cars). Pictured left are the Fabulous Fleetwood owners with their Certificates of Appreciation. Read about the show in the Caddie Chronicle. 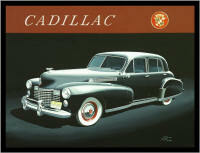 The theme for 2009 was Celebrating Capitol Cadillac’s 75th Anniversary. Following the theme, the show gave special honor to nine cars sold new by Capitol Cadillac from its old location in Washington, D.C. – that is, cars sold new by the dealership in 1979 and before. The cars ranged from a 1941 Series 75 Seven Passenger Formal Sedan to a 1973 Series 75 Formal Limousine. These "alumni cars" returned for a homecoming celebration. A commemorative program was distributed to the participants and included descriptions of the cars, the names of their owners, and a short history of each car. Read all about it in the Caddie Chronicle. 2008's theme was Cadillac Dream Cars and featured both of the remaining 1953 Cadillac LeMans concept cars for the first time ever. Spectators came from as far away as California to see those cars plus other concept cars including the 1956 Maharani ("Kitchen Sink Cadillac"), the 2002 Cien and the 2003 Sixteen. The show was featured in The Self-Starter and Cars & Parts magazine. Read about the show in the Caddie Chronicle. For 2007, the theme was Legacy of LaSalle: 1927-2007. The show attracted 90 cars, including 18 LaSalles. The show was featured in the CLC 's The Self-Starter magazine. Read all about the show in the Caddie Chronicle. A 10 minute DVD showcasing over 130 pictures from the show displayed to LaSalle period music was created and is available for sale. See more information on the commemorative DVD! The 2006 theme was Eldorado Extravaganza: 1953-1966. Over 100 cars were in attendance, including 25 rear-wheel-drive Eldorados representing each year except 1963 and 1965. It was the largest car show ever held at Capitol Cadillac until it was surpassed by the Fabulous Fleetwoods show in 2010. Read more about the show in the Caddie Chronicle. 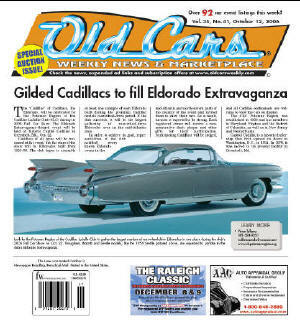 The show was also featured on the front cover of Old Cars Weekly (pictured left), in Hemmings Classic Car and in The Self-Starter. 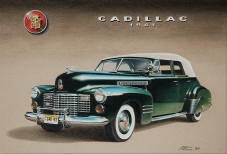 In 2005, the theme was Celebrating V-12 & V-16 Cadillacs and the show attracted 91 cars, 11 of which were V-12s and V-16s. It is believed to be the largest gathering of V-12s and V-16s in recent Mid-Atlantic history and was featured in The Self-Starter and in Hemmings Classic Car. Read about it the Caddie Chronicle. In addition to the car shows, the club hosts other annual organized events such as driving tours, picnics and a holiday gala. Email the Potomac Region with questions or for more information. 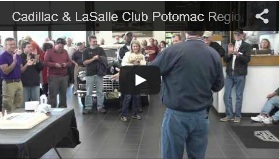 Copyright © 2019 Cadillac & LaSalle Club, Inc. Potomac Region - All rights reserved. Questions or comments? Email the Potomac Region.